SACRAMENTO, Calif. – Just in time for National Preparedness Month, the California Emergency Management Agency has partnered with the California Seismic Safety Commission (CSSC) and California Earthquake Authority (CEA) to launch “Totally Unprepared” – a unique and insightful multimedia campaign geared to help Californians better understand their risk of earthquakes and how to prepare for them. Today, the campaign released its first in a series of videos showing Californians taking simple steps to keep themselves safe in the event of an earthquake. The first video features former NFL star Vencie Glenn as he admits he wasn’t prepared and actually suffered damages from a recent earthquake. The best part is that he learns what to do to safely secure his home and safeguard his property from damages. With a bevy of online resources and new videos set to be released each Tuesday through March of 2012, the campaign hopes to leverage the power of social media in getting the word out. A special 30-minute program is also being aired on twelve California Public Television Stations throughout the month of September. In addition to weekly videos, the Totally Unprepared campaign will incorporate the use of other social media sharing, blogging, and an accompanying website dedicated to spreading the message of preparedness. The use of these familiar online channels encourages the public to not only participate but share the message among their own networks and beyond. The Totally Unprepared campaign centers around two web-based television series created by a veteran of reality television. In addition, the campaign is supported by a website containing news, resources, preparedness tips, and regular blogs. For more information about preparing for earthquakes and other hazards, visit www.calema.ca.gov. With earthquake insurance from the CEA, you and your family will have the financial strength to rebuild. Working with our network of leading insurance companies, we provide claim-paying power and expert service. Together, we’re providing peace-of-mind no earthquake can shake. For more information, visit www.EarthquakeAuthority.com. Yosemite National Park is providing this information in cooperation with and support to the South Central Sierra Type II Team and the Sierra and Stanislaus National Forests. Motor Fire (37.6625 x 119.8714; Sierra National Forest, Mariposa County): The Motor Fire began approximately 12:30 PM, August 25. It was started by a vehicle fire (recreational vehicle) on Hwy 140, along the Merced River and near Cedar Lodge. The fire quickly spread to Sierra and Stanislaus National Forest’s lands. As of 12:30PM, August 30: This will be the last Motor Fire Update released from Yosemite National Park. The Incident Management Team will continue to provide Motor fire information updates. Although residents are allowed back into their homes, the fire is an active incident. Residents and visitors to the area should remain alert to changing fire conditions. Highway 140 is open, use caution when travelling in the area due to continuing fire suppression operations and the potential for debris (rocks, logs, etc.) on the roadway. Approximately 1,200 firefighters are on scene; however resources are being released. Air operations may continue to work the fire. Steep terrain and hot temperatures continue to make firefighting conditions difficult. Although the fire is not located in Yosemite National Park, we have been happy to support the fire suppression efforts of the South Central Sierra Interagency IMT, Mariposa County, Sierra and Stanislaus National Forests, and California Highway Patrol. The park is thankful for their work and to the firefighters who continue to make this operation successful. The fire information call center will shut down at 6:00pm 8/30/11. All further calls concerning the fire should be directed to the Team PIO (951) 225-4516. WASHINGTON - Today the five-member National Transportation Safety Board cited a California utility operator's lax approach to pipeline safety and the inadequate oversight of two government agencies in the probable cause of the most devastating pipeline accident in a decade. "Our investigation revealed that for years, PG&E exploited weaknesses in a lax system of oversight," said NTSB Chairman Deborah A.P. Hersman. "We also identified regulators that placed a blind trust in the companies that they were charged with overseeing to the detriment of public safety." At about 6:11 p.m. (PDT) on September 9, 2010, a 30-inch diameter segment of a natural gas transmission pipeline, owned and operated by PG&E, ruptured in a residential neighborhood in San Bruno, California. The force of the rupture ejected a 3000-pound 28-foot-long section of pipe about 100 feet from where it had been buried four feet underground. The released natural gas ignited into a towering fire that destroyed 38 homes and damaged 70. As a result, eight people were killed, dozens were injured, and many more were evacuated from the area and displaced from their homes. The nearly year-long NTSB investigation revealed that PG&E did not know what kind of pipe it had installed beneath the city of San Bruno in 1956. PG&E records initially provided to NTSB investigators indicated that the ruptured section of pipe was a 30" seamless pipe when in fact, at the time, no manufacturer produced seamless pipe. Investigators also determined that the ruptured section of pipe was a collection of short pipe pieces, commonly known as "pups," joined together with welds. Further metallurgic assessment by NTSB investigators determined that some of the pipe sections did not meet minimum material specifications and that the welds were poorly constructed. The defective welds would have been visibly detectable at the time of the installation, but, because of PG&E's inadequate quality control during the construction project and its failure to maintain accurate records, the poorly welded section of pipe went undetected for over 50 years. Failure of one of the improperly welded seams caused the Sept. 9, 2010, rupture during an increase in pressure resulting from repair work being performed at a terminal upstream of the rupture site. The Board determined that the accident was clearly preventable stating that PG&E's inadequate pipeline integrity management program failed to identify, detect, and remove the substandard pipe segments before they ruptured. "This tragedy began years ago with PG&E's 1956 installation of a woefully inadequate pipe," said Chairman Hersman. "It was compounded by a litany of failures - including poor recordkeeping, inadequate inspection programs, and an integrity management program without integrity." In its examination of the history of oversight of PGE, the NTSB found that two key regulatory decisions (one by CPUC in 1961 and one by PHMSA in 1970), which "grandfathered", or exempted, older pipelines from the testing protocols required of newly constructed ones, allowed the flawed pipe to escape detection. The Safety Board found that CPUC, did not effectively evaluate or assess the safety of PG&E's integrity management program. On the federal side, the NTSB said that PHMSA's grandfathering of pre-1970 pipe contributed to the accident. "For government to do its job - safeguard the public - it cannot trust alone, it must verify through effective oversight," said Hersman. "As we saw in San Bruno, when the approach to safety is lax, the consequences can be deadly." of America, the International Association of Fire Chiefs, the International Association of Firefighters, and the National Volunteer Fire Council. During the course of the investigation, the NTSB issued 10 safety recommendations (six of them classified as urgent) to PG&E, PHMSA and CPUC to address issues in record-keeping, information sharing, pipeline testing, and emergency preparedness and notification procedures. A synopsis of the NTSB report, including the probable cause, conclusions, and a complete list of all the safety recommendations, is available on the NTSB's website, at http://go.usa.gov/kJd. The NTSB's full report will be available on the website in several weeks. Containment: Full containment is expected later today. Conditions: The fire is moving in a northeasterly direction. Cause: Under Investigation, blaze may have been sparked by a car crash. The California Highway Patrol reported on its website that a Toyota Camry hit a pole and caught fire about 10:30 a.m. Monday near the intersection of Pala Temecula and Moro roads. Cooperating Agencies: CAL FIRE, US Forest Service, Sycuan Fire, Pala Fire, LA County Fire, San Diego Sheriff & California Highway Patrol. The Motor Fire started August 25, 2011 at approximately 12:30pm on Hwy 140, along the Merced River and near Cedar Lodge. This fire is located in very steep, rugged terrain making access difficult. The South Central Sierra Interagency Incident Management Team assumed command of the fire on August 26, 2011. All evacuations will be lifted at 9:00 p.m. on tonight. These evacuations include Rancheria Flat, Cedar Lodge, Incline, and El Portal Trailer Village. Law Enforcement will be assisting residents in returning to their homes. Highway 140 will remain closed until tomorrow, August 30th. Hwy 140 will be opened at 6:00 a.m. for traffic traveling east bound toward El Portal. Westbound traffic will be open at 6:45 a.m. Firefighters and equipment will remain along Hwy 140 and in the communities. Residents are advised to please use caution when driving along these routes. Today fire crews concentrated on building containment lines on the east side of the fire. Crews made good progress on the fire throughout the day. Helicopters made good progress in supporting fire crews through the day as needed. Stanislaus Forest Road 1S12 is closed from Yosemite Park Boundary to Five Corners. difference in slowing the fire. The use of the DC-10, heavy tanker provided an the opportunity to check the spread and provide the hand crews with opportunities. Fire crews will continue to work on building containment lines around the fire today. Crews made good progress on the fire throughout the night. The fire was most active on the ease side. There were a couple of hot spots on the west side of the fire, other areas showed little activity. There was no movement on the north side of the fire. Air support will continue to help support crews through the day as needed. Rancheria, Cedar Lodge, Incline, El Portal Trailer Village and campgrounds along Incline Road are under mandatory evacuations. Old El Portal has been advised to prepare for evacuations. 900 acres, 30% contained as of 2100 hours last night. Values at risk include natural cultural resources including endangered species desert tortoise. Ridge CA-CNF-002676; Pine Valley, San Diego County. 150 acres, 35% contained as of 2300 hours last night. There was potential on the east flank for spreading to private property if line doesn’t hold. Extremely steep terrain, hampering control efforts. 4,755 acres, 35% contained, Fire activity continues on the east flank of the fire. Isolated hot spots and areas of interior burnout were observed on the Divisions north of the Merced river. Fire south of the Merced showed little activity. Crews made good progress through the night. 67 acres 60% contained. Heavy brush and grass, citrus groves. Greenspot Road opened both directions at 0400 hours. 345 acres, 85% contained. No fire behavior was observed last night. Hot weather slowing progress of mop up efforts. Update: 8-29 0700 - Motor; Mariposa County 4,755 acres, 35% contained, Fire activity continues on the east flank of the fire. Isolated hot spots and areas of interior burnout were observed on the Divisions north of the Merced river. Fire south of the Merced showed little activity. Crews made good progress through the night. Update: The fire has burned approximately 4,626 acres and is 35% contained. Approximately 849 firefighters are on scene. Air tankers and helicopters will continue to work the fire. This fire is terrain driven (very steep slopes) and has burned to the top of the ridges above the Merced River on both the south and north sides. Temperatures are very hot – 108 to 110 degrees in El Portal. The most active portion of the fire is to the north side of the Merced River on steep slopes. Crews in the El Portal area are utilizing old fire lines from previous fires (i.e. Woodlot, Big Meadow). Significant progress was made on containing the south side of the fire. Update: 1:30PM, August 28: The South Central Sierra Type II Team took over command of the fire at 18:00 on August 26. This team includes support and members from many agencies. 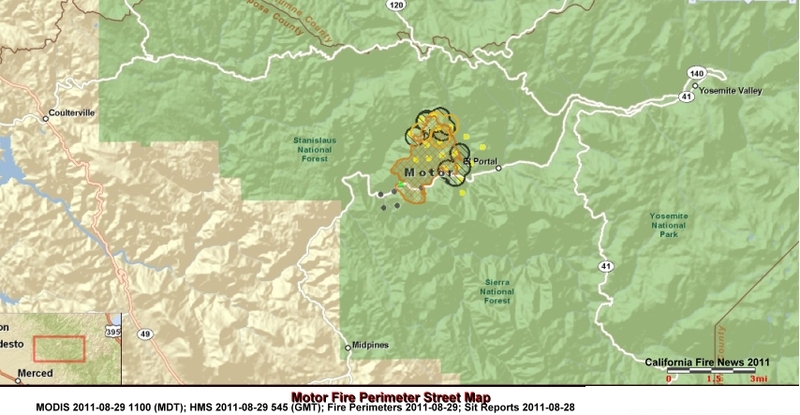 The fire moved into the Moss Creek drainage, prompting the evacuation of Rancheria Flat, August 27, 2011. The community of old EP Portal has been advised to be ready to evacuate. Evacuations and Road Closures: Rancheria Flat, Incline RD, Cedar Lodge and local campgrounds were evacuated. Old El Portal and Yosemite West are advised to prepare for evacuations. Residents should be prepared to leave with only a few minutes notice. Highway 140, from El Portal RD west to the Bug Hostel in Midpines is closed. This closure may fluctuate as the fire progresses. There is no estimation as to when Hwy 140 will re-open. Fire information officers are present in each of the most affected communites to provide the most current fire information. All interested apathies are receiving this fire update, including hotels, concessionareis, park partners and Gateway communities. Motor Fire Incident Information: (37.071 x 119 52.875; Sierra National Forest, Mariposa County): The Motor Fire began approximately 12:30 PM, August 25. It was started by a vehicle fire (recreational vehicle) on Hwy 140, along the Merced River and near Cedar Lodge. Conditions: The fire is moving in an eastward direction. The fire is burning in steep terrain with limited access. Structure Threats: 70 residences and 2 commercial buildings threatened. Special Hazards: Access issues and terrain. Power lines in area. More Info: A Information center is open in Yosemite with fire information hotlines” staffed and operational 24 hrs: (209) 372-0327 or 372-0329. These lines are extremely busy, and please be patient. Please do not call fire dispatch. The employee hotline is also being updated regularly; 379-1186. The "Motor Fire" Stanislaus National Forest, HWY 140 along the Merced River, Mariposa County near Yosemite National Park, evacuations currently in progress. South Central Sierra Inter-agency Incident Management Team command . Motor Fire Copyright 2011 from Tim Walton on Vimeo. 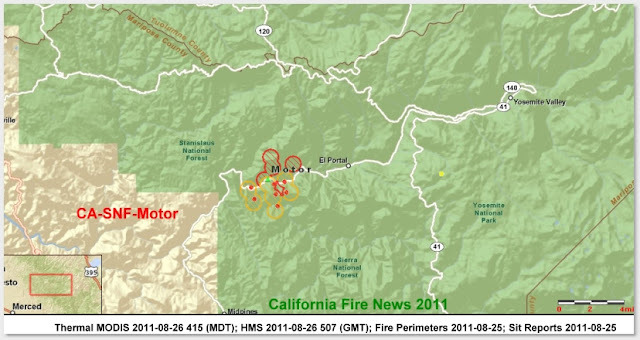 The Motor Fire started August 25, 2011 at approximately 12:30pm on Hwy 140, along the Merced River and near Cedar Lodge. This fire is located in very steep, rugged terrain making access difficult. Firefighters continue to make progress in line construction. Hand and engine crews are in place for structure protection along with air support. South Central Sierra Interagency Incident Management Team assumed command of the fire on August 26, 2011 at 6:00P.M. Yosemite West, Old El Portal, Rancheria, Incline, and Jerseydale have been advised to prepare for evacuations. Motor Fire (37.071 x 119 52.875; Sierra National Forest, Mariposa County): The Motor Fire began approximately 12:30 PM, August 25. It was started by a vehicle fire (recreational vehicle) on Hwy 140, along the Merced River and near Cedar Lodge. The cause is being investigated. 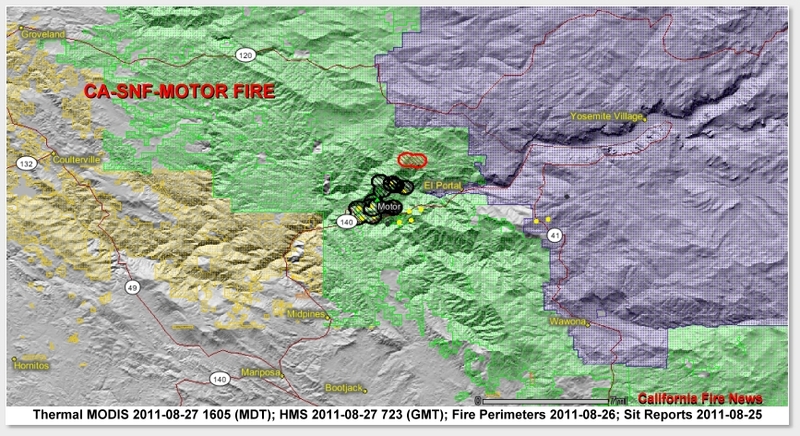 As of 21:00, August 26: The fire is still in the initial attack stage. The South Central Sierra Type II Team took over command of the fire at 18:00 on August 26. This team includes support and members from many agencies. Visit http://scsierra.imtcenter.net/main/index.aspx for more information. Additional fire resources have been ordered, including Hot Shot crews, engines, additional aircraft, and dozers. The fire made a significant run in Dry Gulch bringing managers near a decision point for evacuations in Rancheria Flat. The fire has burned approximately 3,000 acres. Approximately 650 firefighters are on scene. The most active portion of the fire is the NE corner, the Trumbull Peak area. Crews in the El Portal area are utilizing old lines from previous fires (i.e. Woodlot, Big Meadow). Evacuations and Road Closures: Incline RD, Cedar Lodge and local campgrounds were evacuated. 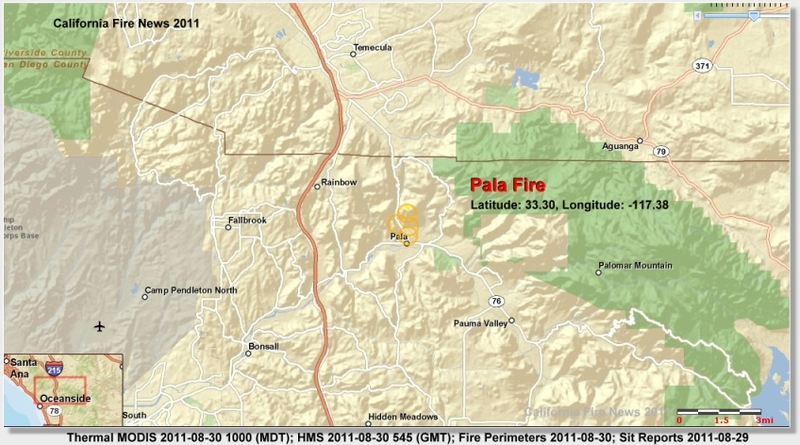 Rancheria, Old El Portal, and Yosemite West have been advised to prepare for evacuations. Residents should be prepared to leave with only a few minutes notice. Highway 140, from the Foresta Bridge west to the Bug Hostel in Midpines is closed. This closure may fluctuate as the fire progresses. There is no estimation as to when Hwy 140 will re-open. Power may be intermittent throughout the day and may go out. Two Yosemite Fire information “hotlines” are staffed and operational 24 hrs: (209) 372-0327 or 372-0329. Please do not call fire dispatch – they are busy. The employee hotline is also being updated regularly; 379-1186. SACRAMENTO – With Hurricane Irene bearing down on the East coast, California is lending a helping hand by deploying experts trained in search & rescue, emergency operations, planning and logistics to help with state and local emergency response efforts. "We're hoping for the best for all of those in the path of Hurricane Irene and we urge residents to take this storm seriously," said Cal EMA Acting Secretary Mike Dayton. "California stands ready to provide assistance to our sister states as they prepare for this natural disaster," said Dayton. "We're appreciative of the help we received in the past and are glad to provide help in their time of need." In anticipation of the storm's impact, several eastern states have requested assistance through the Emergency Management Assistance Compact (EMAC), a congressionally ratified agreement that provides form and structure to interstate mutual aid. Through EMAC, Cal EMA is in discussions with New York state to deploy possibly six emergency service coordinators with experience in Emergency Operation Centers and an Incident Management Team (IMT) to assist in emergency response, remaining there until the situation stabilizes. The IMT is the Easy Bay Type 3 Incident Management Team and consists of 36 first responders from Alameda and Contra Costa Counties. Expenses for the deployment will be covered by the state(s) requesting assistance. Cal EMA will be in constant contact with emergency management staff on the East coast for future requests. California has also deployed several members to form an Urban Search and Rescue Task Force (US&R). These are common requested organized by FEMA and have responded to various disasters around the world. California Task Force members deployed to the east coast include one member from CA-TF6 (Riverside), two members from CA-TF2 (Los Angeles), three members from CA-TF8 (San Diego). For more information about efforts along the east coast, visit fema.gov for links to specific locations. Update: 0900hrs - S/T 9474G dispatched to Motor Fire. Air Tankers 79, 80 & 81 released from incident. Tankers 82 & 83 from Columbia still committed and reloading in Columbia. About 1200 Aug. 25, a motor home caught fire in the Merced River Canyon near Calif. Hwy 140 in Mariposa County. Fire spread to both sides of the Merced River, on the Sierra National Forest to the south and the Stanislaus National Forest to the north. As of 1900 about 1000 acres hab burned with the fire mostly moving up the north slope towards Trumbull Peak where a historic fire lookout tower sits. Spotters are directing helicopter drops in the area of the tower in an attempt to preserve the structure. The Sierra National Forest is directing the response. Evacuations and Road Closures: Cedar lodge, Incline and local Merced River Canyon Campgrounds were voluntarily evacuated. Rancheria, Old El Portal, and Yosemite West have been advised to prepare for evacuations. Highway 140, from the Foresta Bridge west is closed. There is no estimation as to when Hwy. 140 will re-open. 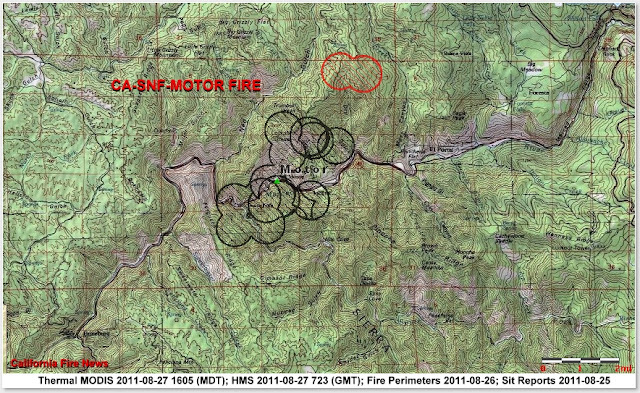 Outlook/Planned Actions Air tankers, Helicopter types 1&2,Dozers, Hotshot Crews, Type 1,3&6 engines. The Central Sierra Type two Incident Management Team will be on scene Aug. 26 to take command of the fire response efforts. Additional fire resources have been ordered. Terrain Difficulty The fire is terrain driven in very steep canyon slopes, and has burned to the top of the ridges above the Merced River on both sides of the canyon. Local Law enforcement recommend procationary measures. Stay away from Hwy 140 heading to Yosemite National Park. Residence south of the Yosemite maintenance station are being evacuated. More Info: Yosemite National Park has provided two "hotline" numbers for the public to call for fire informaiton 24 hours per day: (209) 372-0372 or 372-0379. SACRAMENTO, Calif. – The California Emergency Management Agency (Cal EMA) is working closely with local officials to provide state and local mutual aid resources for a still-burning 30,000 gallon propane tanker railcar adjacent to a fuel distribution center in Lincoln, CA. The state has sent mutual aid fire engines, an Incident Management Team and fire experts from Cal EMA to the scene to assist local officials in firefighting and protecting nearby residents. "The quick response by local fire and police departments was the first critical step in successfully containing this and protecting residents," said Mike Dayton, Acting Secretary of the California Emergency Management Agency. "I commend the quick action of first responders and the sustained support provided by agencies from around the region. This has been a great example of mutual aid at its best," said Dayton. An East Bay Incident Management Team (IMT) from Alameda and Contra Costa Counties is now on scene assisting the Lincoln Fire Department. The California Emergency Management Agency dispatched three Chief Officers and Emergency Service Coordinators from the Inland Region to the area to assist with coordination and evacuations. As of Wednesday evening, there continues to be dozens of fire trucks and apparatus along with specialized equipment from around the region on scene assisting with the fire. This is a mutual aid effort from the local police and fire departments and nearby agencies that have offered help. Officials emphasized the importance of heading evacuation orders, as the possibility of a catastrophic explosion is still high. "We've learned from history that people who ignore these evacuation orders can end up as fatalities, especially when it comes to high pressure gas tankers on fire for long periods of time," said Dayton. "Please evacuate to the shelters. That's why they are open." The American Red Cross has set up three evacuation centers — and school schedules in the area have been canceled. For information about evacuations and the latest conditions call the Placer County Office of Emergency Services at (916) 625-5088. City of Lincoln Emergency Information Line: (916) 434-2450 Red Cross “Safe and Well” website for evacuated people to register/loved ones to find evacuated loved ones: https://safeandwell.communityos.org/cms/index.php or call 1-800-733-2767.